The narrow nose allow for a faster glide and the 34″ width gives you extra stability. 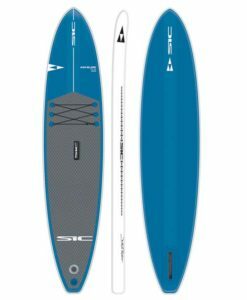 The Starboard Stream Crossover inflatable stand up paddleboards 11’0″ length is designed for river racing with it’s narrow nose to allow for a faster glide and the 34″ width that gives you extra stability for paddleboarders up to 255 lbs. This board is not just a great river runner but makes a great durable all around board to share your time on the water with friends and family. Equipped with neoprene handles and the bungee straps make it easy to store your water bottles and gear while on the water. Being concsiouse of the environment, Starboard uses an inverted EVA deck pad that allows for every other board to use a reverse color combination deck pad for minimize waste. FINS: Ph River fin and white water side fins. * New Leash on White Water fins to reduce the chance of losing the fin should it detach from the fin box. • FCS II SUP Touring 9” fin included on Racers, Deluxe Touring, Atlas, Blend and all Serenity models. • FCS II Connect 8” fin included on Whopper, Wide Point, Drive and Explorer.